When I arrived I was greeted by an excited bunch of students creating some fantastic Red-tail artwork (see image below) with their teacher, Ms Mary French. All eager to learn more about this fascinating and somewhat elusive cockatoo the students settled in to listen and learn about what the cockatoos look and sound like, where they live, where we can find them, what food they eat, why they are endangered and what we can do to help them. Presentations were made to forty one students in grades three and four over two sessions. As with all my talks I did my best to test the student’s prior knowledge, and as usual was very impressed with their existing knowledge and understanding of the cockatoo, its needs and recovery. Of particular interest was a young indigenous boy who told me the aboriginal name for both the Red-tailed Black-Cockatoo (Kiren) and Yellow-tailed Black-Cockatoo (Karwil) in his family’s language. I found this very fascinating and am keen to explore more about the indigenous cultural and spiritual connections our local aboriginal families have with the cockatoo. The students were also given the opportunity to grow some stringybark from seed as part of the presentation. Supplied with stringybark seed and potting mix, the seedlings grown by the students will be planted out later next year. 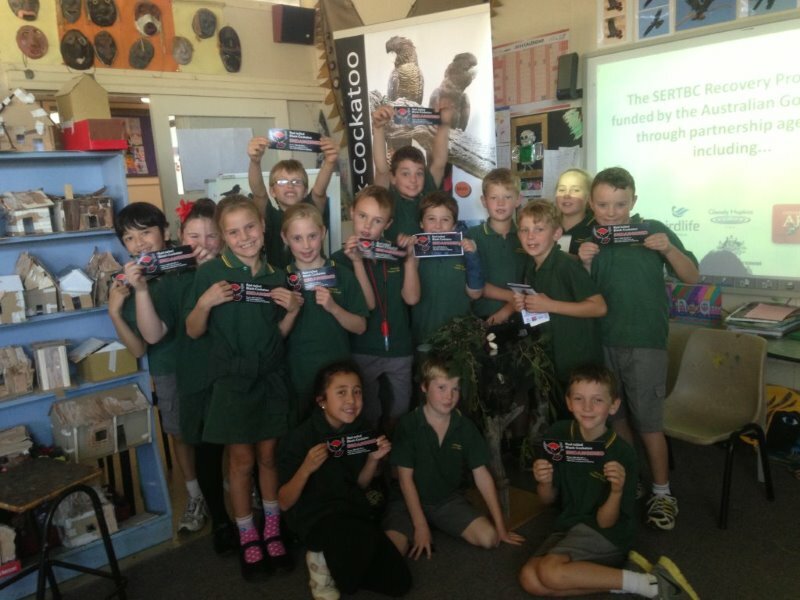 Each student was also given a 1800 sighting sticker, while the classroom was stocked with some posters and booklets about the cockatoo. The visit provided a great opportunity to raise awareness of the cockatoo and encourage students and their families to phone in sightings of the birds. While we know the cockatoos occur to the west and south-west of Dimboola (through Little Desert National Park) we rarely receive reports of birds in this area. It is hoped that the students now know and feel empowered to phone in reports next time they encounter Red-tails. Since my visit I have received some really positive feedback from the school regarding the presentations, with Mary reporting “The students loved and thoroughly enjoying learning all about the Red-tailed Black-Cockatoo”. • “Interesting to hear about how to protect nesting cockatoos from possums. Possum seat young birds,” said Zarnia and Paddy. • “I learnt about the differences between Red-tailed and Yellow –tailed Black Cockatoos,”said Will. • “The sounds they make are very different. The Yellow-tail is much louder,” said Malcolm, Jordy, Paige, Paddy, and Millie. • “I learnt where they live,”said Evan. • “I found out they are endangered,” said Eamon. • “I have seen black cockatoos in Pimpinio,” said Mary. • “I learnt where Red-tailed Black cockatoos live and what they eat. I didn’t know what the Red-tailed Black Cockatoo ate,”said Emma. • “They nest in a big dead tree near our house (Lochiel Bridge on the road to Nhill),”said Harrison. • “The gum nuts contain seeds as nutrition. Food sources are becoming scarce,” said April. • “There was a possum in a hollow where cockatoos nest near our house (Gerang Gerung),” said Tom. • “I liked everything about the talk,” said Kitt. • “I had a talk from Bronwyn when I was in Preps at Jeparit and I remember everything she told us,”said Ashton. It’s wonderful and very gratifying to hear that the students have taken something away from the presentations. I look forward to hearing more from the class regarding their stringybark propagation later in the year. 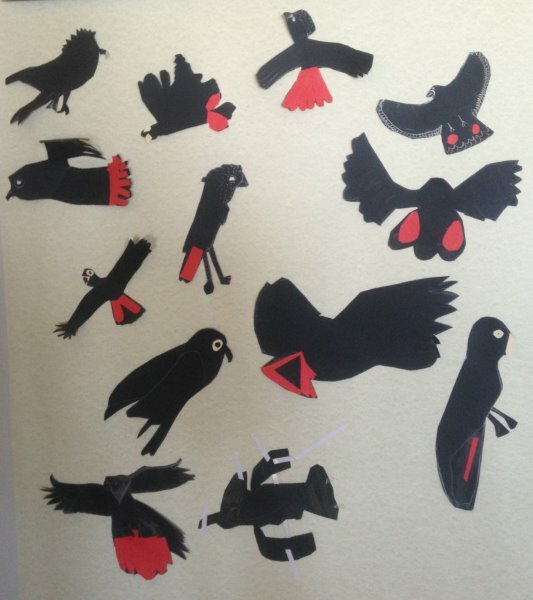 The students created some fantastic Red-tailed Black-Cockatoos as part of their art class. Fantastic effort kids!